Productivity app Any.do has been updated to Version 2.0, offering advanced features to users that bridge the gap between a user’s work, family and personal lives. Inspired by users who were utilizing Any.do in new ways, the platform now offers features for instantly sharing and coordinating on lists with others, including the ability to communicate with business and work teams, and more. While the base app remains free to download and use, many features are only available to Any.do premium subscribers. Any.do has been updated with a selection of note-taking features, and allows users to import files from Dropbox to those notes. For free users, these files can be up to 5MB in size, while premium users receive support for unlimited file sizes, across all kinds of files. Notes can also be customized with photos, videos or recorded audio messages. Also for premium members, users can create customizable reminders for each and every task in their life, from being reminded to call their mom once every three days, to a reminder for the weekly status meeting at work. Location-based reminders are also supported. While free users have access to the same white, streamlined interface they’re already familiar with, premium users on iOS and Android can also choose from five color themes to match their mood or personality. When collaborating with others, free Any.do members can assign and discuss tasks with one other member per task (this is unlimited for premium subscribers). This isn’t restricted to just business collaboration, as spouses may use the app to instantly share their grocery lists, as an example. To be specific, users can invite others to join these tasks with them, and users need to accept these invitations to join the groups. Any.do 2.0 is available to download for free on the iTunes App Store and Google Play, and is also available for free on the Web. 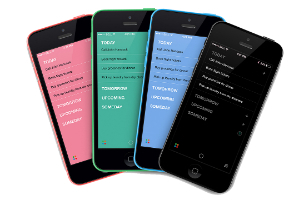 A user’s notes and to-do lists sync when Any.do is used across multiple devices. For the next 14 days, users can upgrade to the platform’s premium service for a discounted price of $3 per month or $27 per year. This will revert to the original price of $5 per month or $45 per year at the conclusion of the promotional period.